If you’ve followed my blog for a while, you’ll know I am trying to make more conscious choices. 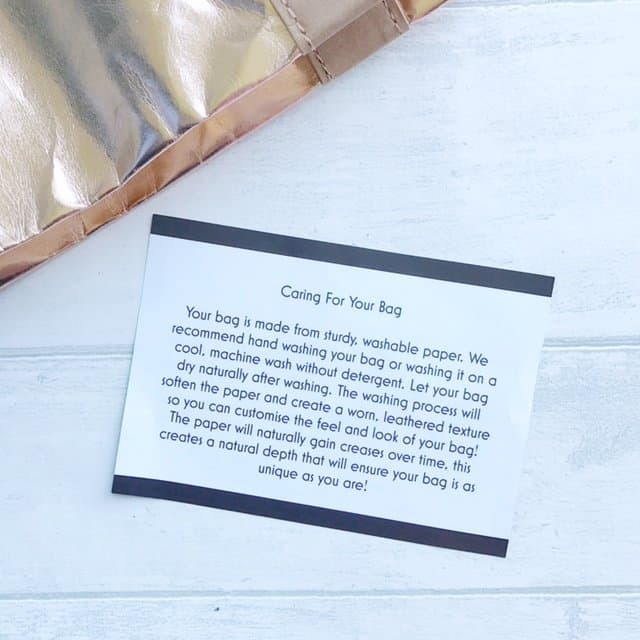 That means choosing chemical-free, eco-friendly beauty products, and trying to create a greener home. I’m trying to pick better clothes for the girls, and we love their gorgeous organic Piccalilly kids clothes. When it comes to my clothes, however, I need to try harder. Organic and sustainable clothes and accessories are more expensive, and harder to come by. I have found some nice options, but often the sustainable companies offer more ‘classic’ options, that are less fashion-led. This makes sense, as the idea is that you invest in quality, and it lasts you much longer. I am by no means a slave to fashion, but I do like to look vaguely up to date. So I’m delighted to discover a brand called My Paper Tote. 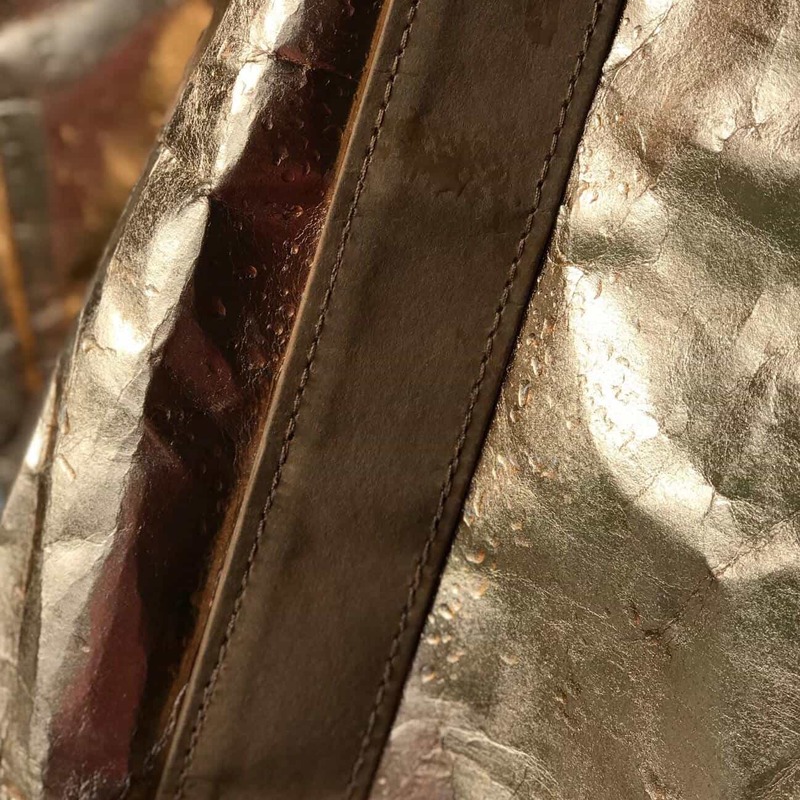 They make the most gorgeous leather-look bags, out of paper. And you can wash them. I kid you not. 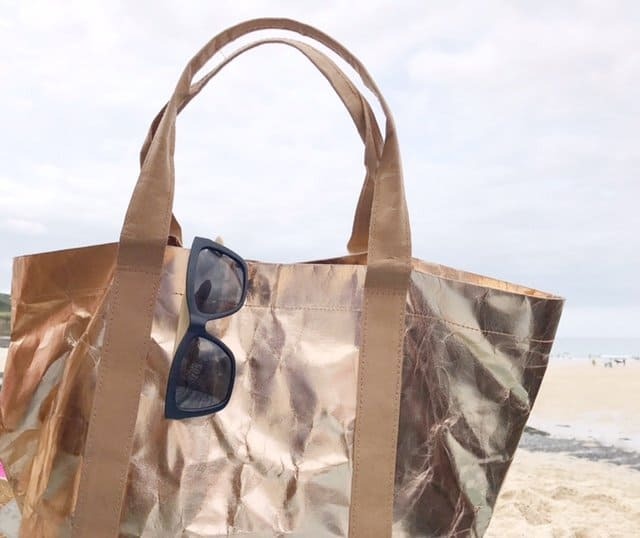 I treated myself to a rose gold paper tote bag, just before our summer holiday. I’ve been using it ever since! My Paper Tote sustainable tote bags are totally vegan. They are made of washable paper from the USA, which is coated with non-harmful synthetic polymor for water resistant and tear resistant properties. They do not use Pentachlorophenol, PVC or BPA. The paper has been tested in line with Oeko Tex Standard 100 and is safe for contact with human skin. My Paper Tote advise hand washing your bag, letting it dry naturally. I haven’t had to wash mine yet, but they say that it gets softer with each wash. You can customise it by scrunching it up, to add texture. 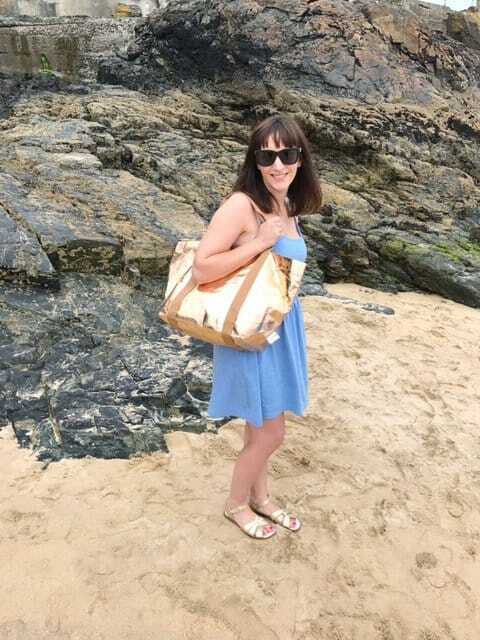 I used my My Paper Tote every day on holiday as a beach bag, and it’s the perfect size – you can cram so much in there! Look how big it is! The sand did slightly rub off the metallic colour in some of the base corners, but nothing too noticeable. 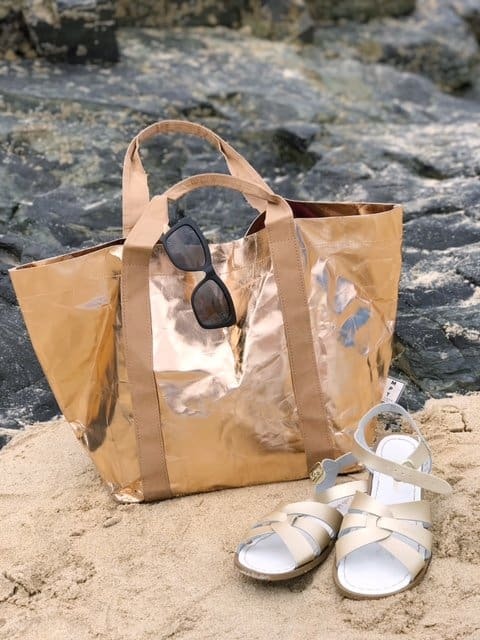 It also goes so well with my gorgeous gold Salt-Water Sandals. The one improvement I could suggest is adding some pockets. Because the bag is so big, things get lost at the bottom. 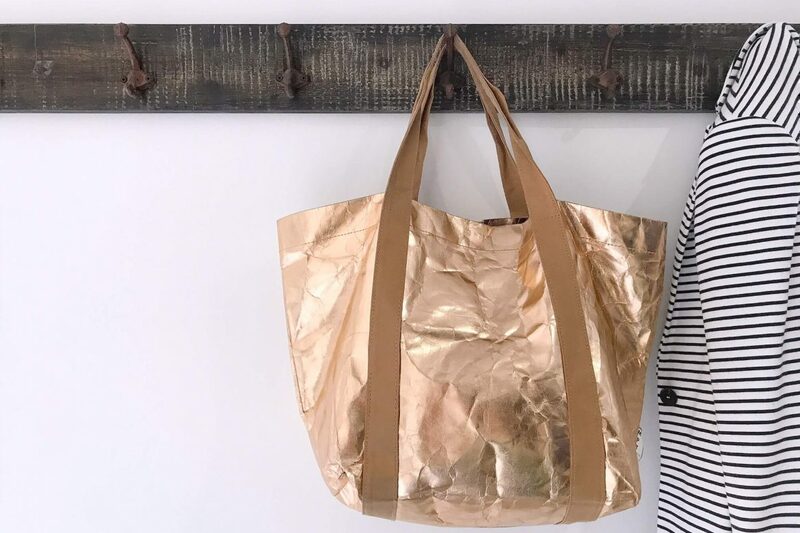 What Your Own Sustainable Tote Bag? 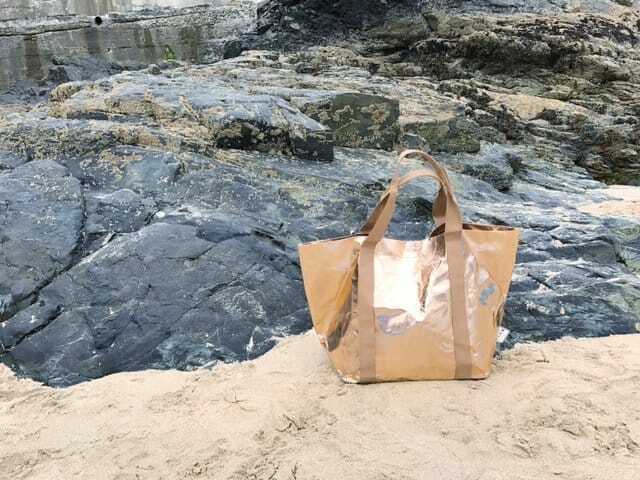 If you’ve fallen for my lovely sustainable tote bag (and I don’t blame you one bit!) 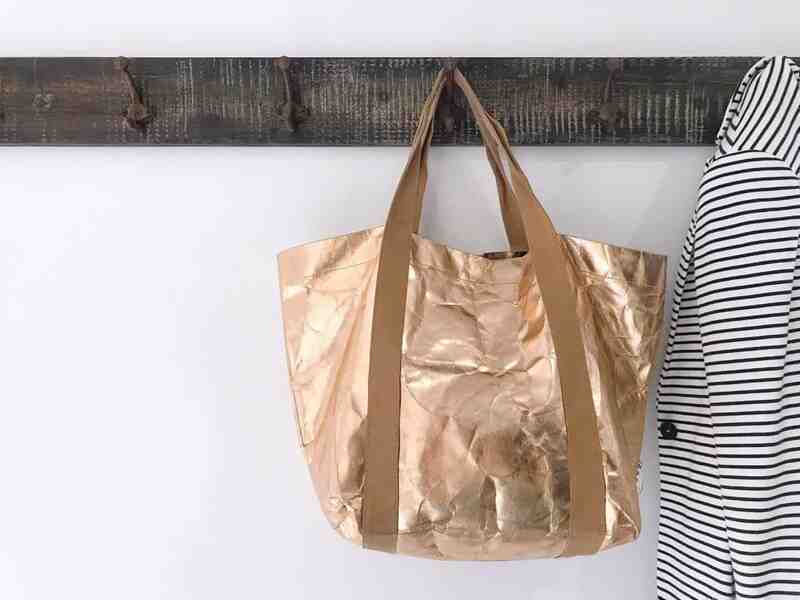 You can buy a rose gold one from My Paper Tote here. They also have a silver version. 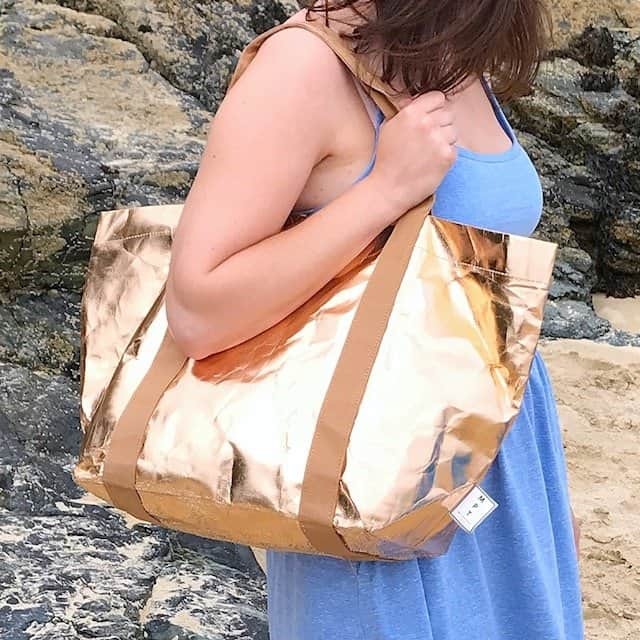 What do you think of my bag tote bag? I am totally obsessed with it, and still use it most days, as it goes equally well with autumn clothes as summer outfits. I can even fit my laptop in it. 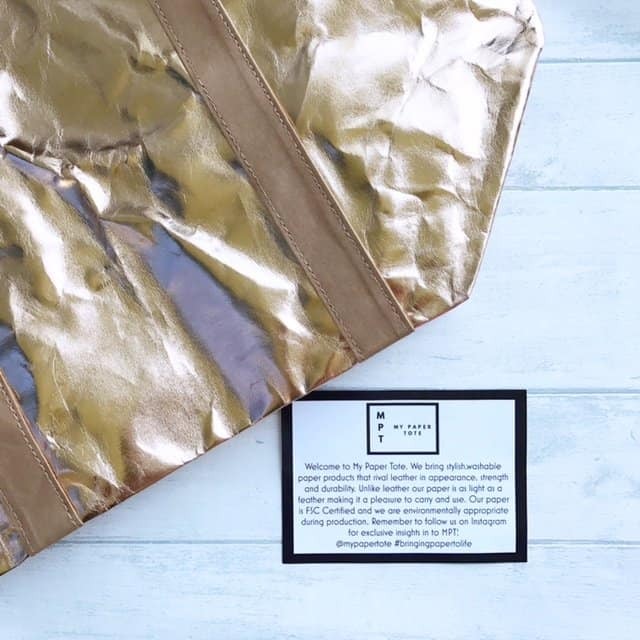 If you have any hot tips for sustainable fashion, I’d love to hear them! I’m on the hunt for new trainers for our wellness challenge. I also need a new winter coat, that’s warm as toast, and waterproof. Plus new winter boots! I’ve had all of my current ones for a minimum of three years (over ten in the case of my trainers!) so they have served me well. This is amazing! I’m always on the lookout for more conscious homeware and living that still looks good – and this is such a little gem of a find – thanks for sharing!